Inexpensive Personalized Cotton Canvas Totes w/ Colored Handles, Custom Imprinted in Bulk. Promotional, High Quality, Budget Prices for USA, Canada. 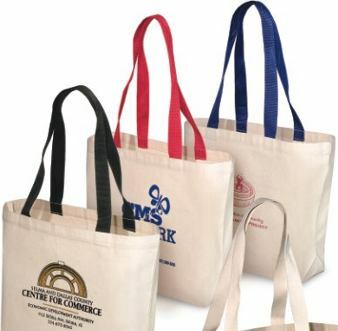 Bulk promotional cotton canvas totes, custom imprinted or blank at clearance prices. Our wholesale canvas totes have colored handles or strips, and are made of sturdy heavyweight 10 oz. cotton canvas. Contact us about the pricing of blank wholesale canvas totes. Free artwork design. We will send you a proof for your approval before production. 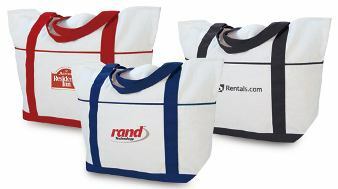 Budget Prices in USA and Canada for bulk promotional cotton totes with colored handles. Color: Natural, with your choice of Black, Red, Green, Navy Blue and Royal Blue handles. CT8 : 19" x 14" x 5" Imprint area: 9”W x 8”H ; Handles: 26" long, shoulder length web handles. • One color one position imprint included. Add the amount shown for each extra imprint color. • Full color printing is available: contact us. Setup Charge: $45.00 per color, per tote. Setup Charge: $50.00 per color; Repeat Setup Charge: $25.00 per color.